NSF International’s office in Ecuador will provide certification, auditing, training, and consulting services for the agriculture, supply chain, retail and environmental service sectors. Having an office in Ecuador represents a great advantage to provide the services due to its convenient location of the country in South America, which facilitates the assistance to countries that surround it. NSF International, a global public health and safety organization with over 70 years of experience in food safety, has opened an office in Ecuador. The NSF International office in Ecuador is founded on a long-standing partnership between NSF International and Agroquality, which has agreed to merge its business with NSF International. The new NSF International team in Ecuador will provide services to the food processor, agriculture, and aquaculture industry. NSF has additional offices in Latin America, including in Peru, Chile, Costa Rica, Brazil and Mexico. Through this merger, NSF International is now strategically placed to help companies meet global and local demands to certify more products according to NSF/ANSI standards, to provide experienced auditing services, to develop sustainable solutions that comply with local and international requirements, and to create robust training programs for food safety. The NSF International Ecuador team will be comprised of the former Agroquality staff members who are very knowledgeable about the food safety industry and have established solid client relationships. This team will be supported by NSF International’s global network. Both NSF International and Agroquality share a proven record of customer satisfaction with clients as well as the core values of ethics and integrity, respect and social responsibility all guided by a commitment to food safety. Agroquality began operations in 2006 by providing added value to Trust Control International clients that needed GLOBALG.A.P. Certification. In 2010 Agroquality added training to its list of services, accredited by SETEC (State Institution). Technical consulting: NSF International offers food safety consulting services including HACCP, GMP Good Manufacturing Practice , GAP Good Agricultural Practices, GFSI Global Food Safety Initiative, that includes BRC, IFS, SQF, FSSC 22000, BAP Best Aquaculture Practices, as well evaluation, risk analysis and traceability throughout the supply chain. Among the consultancy services, NSF Ecuador also offers industrial security and environmental services according Ecuadorian legislation. Certification: Certification programs for HACCP, GMP Good Manufacturing Practices, GFSI Global Food Safety Initiative, that includes BRC, IFS, SQF, FSSC 22000, BAP Best Aquaculture Practices, by auditors with exceptional expertise and capacity. Auditing services: NSF International conducts international franchise audits for major large restaurants with location throughout Latin America. Training and development: NSF International Ecuador team organizes and delivers specialized training programs for the previously mentioned protocols, and about FSMA (Food Safety Modernization Act). Agriculture: NSF provides agriculture certifications such as GAP (Good Agricultural Practices) ,GLOBALG.A.P., and phytosanitary audits. 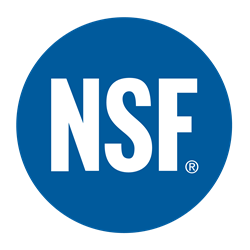 Other services: NSF International’s Ecuador office also facilitates testing services, second and third-party regulatory audits, product certification, etc. For more information about the NSF International Food Safety and Quality Program, please contact Sonia Acuña-Rubio at sacunarubio(at)nsf(dot)org or Amy Robles, General Manager, at amyrobles(at)nsf(dot)org or +593 4 3729410. Editor’s note: To schedule an interview with an NSF International expert, please contact Liz Nowland-Margolis at media(at)nsf(dot)org or +1 734-418-6624. The NSF Global Food Division provides expertise and accredited services across all supply chain sectors, from agriculture, produce, processing, distribution and dairy, to seafood, retail and restaurants. Services include Global Food Safety Initiative (GFSI) certification (SQF, BRC, GLOBALG.A.P., FSSC, IFS, BAP and CanadaG.A.P. ), plus expert auditing, consulting and technical services, HACCP validation and inspection, organic food certification through Quality Assurance International (QAI), and specialty food verification and certification (including Non-GMO Project, gluten-free and Certified Transitional). NSF is also the leading certifier of foodservice equipment and nonfood compounds.